Message 20654 - Posted: 24 Dec 2015, 4:46:58 UTC - in response to Message 20651. Does this mean that results from the legacy tasks will no longer be used? If so, why should I continue to run them on my my main machine which is 32 bit XP? I have another 64 bit Win7 machine that I could use for "virtual box" but I'm not sure that it is worth the hassle. 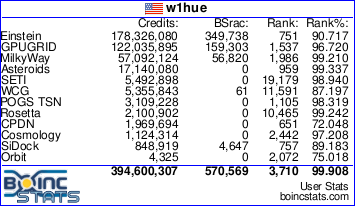 I'm running several other BOINC projects on all 3 of my machines. Message 20659 - Posted: 28 Dec 2015, 0:23:11 UTC - in response to Message 20654. But let me add a bit better explanation here though. The scientific code behind the current Cosmology@Home apps, CAMB, does a small simulation of some of the properties of universe. The problem with the legacy CAMB is that our understanding of the physics behind the simulations is at this point outdated. So the results are in some sense perfectly valid hypothetical universes, they're just not ours. But they're still useful because what we do is not compare these universes with data, but train an algorithm (called PICO) to do the same simulations CAMB does, but much faster. The legacy CAMB results are still useful for testing and tweaking this algorithm's accuracy. But the new camb_boinc2docker CAMB (which is up-to-date) is useful for testing/tweaking and for producing the final PICO results which we do then use for comparing with real data since the physics is right. So for now we are keeping camb_legacy around to allow people who don't meet the requirements for camb_boinc2docker to still be able to contribute. But if you can, the most useful scientifically is for people to run camb_boinc2docker. "So for now we are keeping camb_legacy around to allow people who don't meet the requirements for camb_boinc2docker to still be able to contribute. But if you can, the most useful scientifically is for people to run camb_boinc2docker." Well, I believe that I will remove the project from my three machines and let them work on other projects that are producing more useful science. Message 20661 - Posted: 28 Dec 2015, 14:12:23 UTC - in response to Message 20660. Just to be clear, I myself am not trying to make any claims about the scientific usefulness of camb_legacy vs. any other BOINC project, just of camb_legacy vs. camb_boinc2docker. In any case, I can see the you've crunched a lot for C@H so thank you for your contributions to date! We've tried to make setting up camb_boinc2docker as hassle free as possible, but its completely your call if you'd like to try it. Message 20663 - Posted: 28 Dec 2015, 19:49:36 UTC - in response to Message 20661. "In any case, I can see the you've crunched a lot for C@H so thank you for your contributions to date! We've tried to make setting up camb_boinc2docker as hassle free as possible, but its completely your call if you'd like to try it." Maybe someday after I put together a new machine with faster hardware, more memory and Windows 10.
work units are taking way longer than the estimate predicts: over five hours so far rather than 21mins 28s seconds, with remaining time fixed at 17 seconds. what should i do? abort the work unit? Message 20666 - Posted: 29 Dec 2015, 12:02:43 UTC - in response to Message 20664. See my reply here, I'll try to keep discussion of this issue there. I have just joined the project (recently been looking for better BOINC projects to contribute to). I have looked over the FAQs regarding the matter, but when I went there I found that only some GPUs are supported. Since I have Intel 4000, just to make sure, it will be compatible right? Message 20672 - Posted: 31 Dec 2015, 14:31:39 UTC - in response to Message 20671. Hi Mario, welcome to C@H! Unfortunately we do not support any GPU computing. If you're looking for other Astronomy related projects that do Intel GPU computing I can recommend Einstein@Home, as well as some others you can see here as you probably know. Of course we'd be happy if you crunched for C@H with your CPU and for another project with your GPU. In this case I should mention some users have reported the C@H jobs cause the GPU jobs to slow down a bit, you can see some discussion of this and solutions here. Message 20675 - Posted: 1 Jan 2016, 13:18:15 UTC - in response to Message 20651.